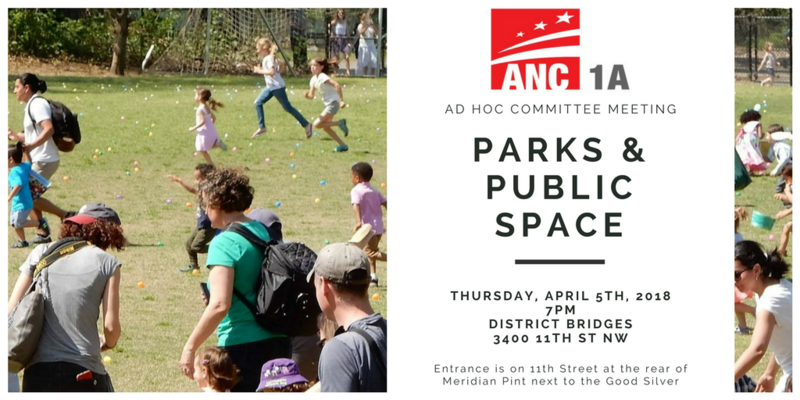 ANC1A Kicking Off Committee to Focus on Parks & Public Spaces on Thursday, April 5th | Park View, D.C.
ANC1A is kicking off a new ad hoc committee focused on parks and public spaces on Thursday, April 5th, starting at 7 pm. The meeting will be held in the office of District Bridges which is located above Meridian Pint. The entrance is on 11th Street at the rear of Meridian Pint next to the Good Silver (3400 11th Street, NW). This is an open meeting and all are invited and welcome to participate. Please share this information with others who may be interested. This entry was posted on April 4, 2018 at 11:34 am and is filed under Parks and Green spaces. You can subscribe via RSS 2.0 feed to this post's comments.